Hunting down the rebel forces can be tiring even for the most dedicated Sith Lord. 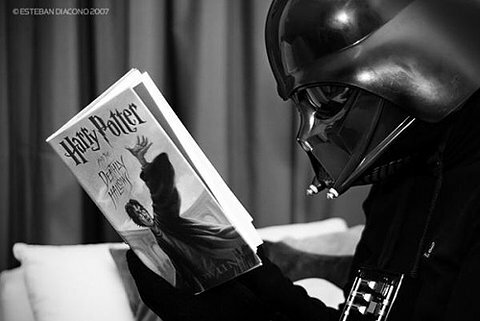 Our cameras caught DARTH VADAR taking a break and reading about another Dark Lord in HARRY POTTER AND THE DEATHLY HALLOWS. If we call him "hot" will he force-strangle us? Picture from here, check it out for other awesomeness including a Hello Kitty Darth.